Sunday Dinners: The Special Occasions. Contributed by The Fante family. Since I was a little girl, Sundays were reserved for family. Both my parents’ businesses – Fante’s (a kitchen wares shop) and Esposito’s (a butcher shop) in the Italian Market of Philadelphia both closed by 2PM in order to have mid-afternoon Sunday dinner. Along with my sister and 3 cousins, we would spend the whole day at our Nonni’s (grandparents’) home: going to church, helping cook dinner and playing together. My Nonna would wake up at the crack of dawn to chop all the vegetables for the gravy and start it simmering with the tomatoes which she would put through a food mill to create a uniform sauce. She would then make the meatballs and sausage, fry them, and add them to the sauce, which would be simmering on low heat by the time my sister and I woke up and made it downstairs for our traditional chocolate chip pancake breakfast (we were totally spoiled). Filled to the brim with pancakes, we would help her to make the pasta dough and leave it to rest, covered, while we went to church. When we returned, we would continue to cook the sauce, allowing it to simmer while we rolled out the dough on the manual pasta maker. All of the cousins took turns working the crank and catching the pasta – it was always at least a 2-cousin job. Normal Sunday dinners meant fresh meatballs, sausage and gravy served with homemade pasta of some kind. For special occasions like birthdays and holidays, we would do trays of lasagna. Nonna would supervise all of the extra tasks for making the lasagna, the most important being the fresh grated cheese. We love cheese! And did I mention our Sunday dinners included an epic amount of food? Every week about 12 family members would join us around a table meant for 6, filled with enough food to comfortably feed 30. These large trays of lasagna require a lot of cheese. The older cousins were responsible to grate about a pound of parmesan and shred about 2 pounds of mozzarella. We all proudly sported some scarred knuckles from the rasp we used [that we swear] she had brought with her from Italy. It was torture. She eventually replaced it with a large rotary grater which made the job so much easier! It handled the volume, and it was simple to swap the drums for each cheese. 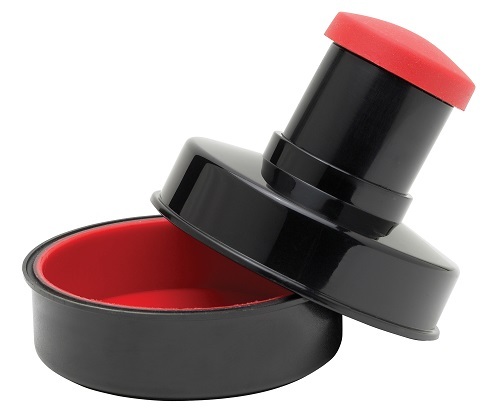 We could also all take turns since it didn’t require as much elbow grease or Band-Aids. We are so excited to have a new cousin (#6) – Nico! We can’t wait for the day we can enlist his help to use the grater named after him to make some Sunday dinner lasagna. Here is the recipe for a smaller-portion of our lasagna. We typically make it with just sauce and cheese. You can certainly substitute bought lasagna for the pasta portions and add meat to customize it to your family’s tastes. 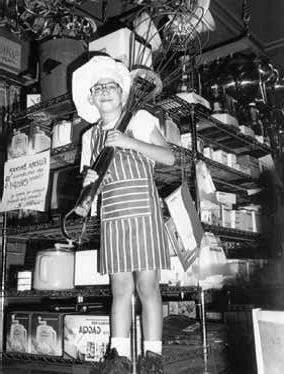 You can also find many of our family recipes (as well as embarrassing family photos) included with the Fante’s line of products. Buon appetito! 1. Brown ground meat in a fry pan then drain off the fat. Place salsa marinara in a sauce pan, stir in browned meat and heat gently over a medium flame until it’s hot. Stir occasionally to keep it from sticking. 3. Spoon hot meat sauce into the bottom of a 11” x 15” baking dish. 4. Place a single layer of lasagna strips into the baking dish, lengthwise. Layer with grated cheese (try Fante’s Papa Francesco’s Rotary Cheese Grater or Fante’s Cousin Nico’s Suction Base Cheese Grater, available at Fante’s) and mozzarella then top with meat sauce. Repeat these steps for the second layer but place lasagna strips widthwise. Alternating the direction of the pasta strips will keep your lasagna from falling apart when it’s cut. 5. Repeat step 5 to make as many layers as you like. Finish by spooning more sauce on top and sprinkle with grated cheese. 6. Bake at 350°F for 45 minutes or until sauce and cheese are bubbling. Remove lasagna from the oven and let rest for 30 minutes before serving. 1. 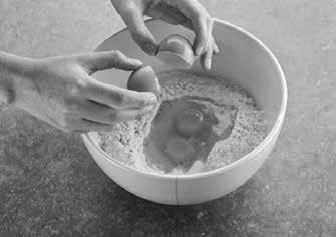 Place flour on a wooden board, make a well and break the eggs into it. 2. 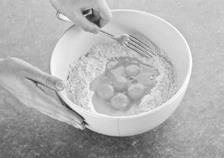 If you prefer, you can mix it in a bowl with a fork or in an electric mixer with a dough hook. 3. Slowly incorporate the flour into the eggs. There should be just enough moisture so the ingredients stick together to form a smooth, elastic ball but not enough to stick to the table or bowl. 4. 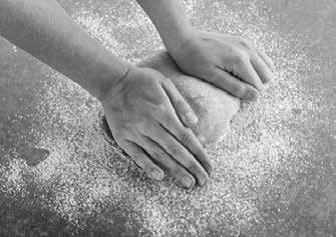 You may need to add a bit of water if the dough is too dry and crumbly, or a bit more flour if too wet and sticky. 5. Cover the dough with a clean towel and let it set for about 30 minutes. 6. Use a sharp knife to cut off a chunk from the ball (photo 4). 7. 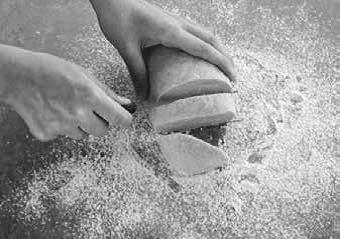 Flatten the chunk of dough with the heal of your hand then roll it out to the desired thickness with a floured rolling pin. 8. Proceed with Step 2 of Aunt Gina’s lasagna recipe instructions, above. 1. Sauté garlic, onion and red pepper in olive oil. Remove them from the oil before they brown. 3. Simmer for about 40 minutes. 4. After 15 minutes add salt and pepper to taste. 5. After another 30 minutes, check sauce for consistency; if too watery, leave lid off to reduce. 6. Stir often to avoid sticking, especially if the pot you’re using does not have a heavy bottom. This entry was posted in Cook - Recipes from Friends, Useful Tools and tagged Cook, Fante's Italian Cooking Tools, Fante's Italian Family Recipes, Italian Market Philadelphia, Lasagna, Olive oil, Pasta, Pasta Tools, Sunday Dinners, Tools Exclusively from HIC Harold Import Co. on May 7, 2013 by The Fante Family.